Select model and size NL-273 - 8.5" x 2" NL-274 - 8.5" x 6.25" NL-275 - 8.5" x 5" NL-276 - 10.5" x 6.25" NL-277 - 12" x 6.25" NL-278 - 12" x 2"
Choose a size and shape above. Click the image for a larger view. These banding wheels represent excellent workmanship featuring cast iron/aluminum wheels and a ring of steel ball bearings which provide smooth and easy operation. The concentric circles on the head allow for easy centering. All but the 2" wheels offer high shank for easy use for large hands. 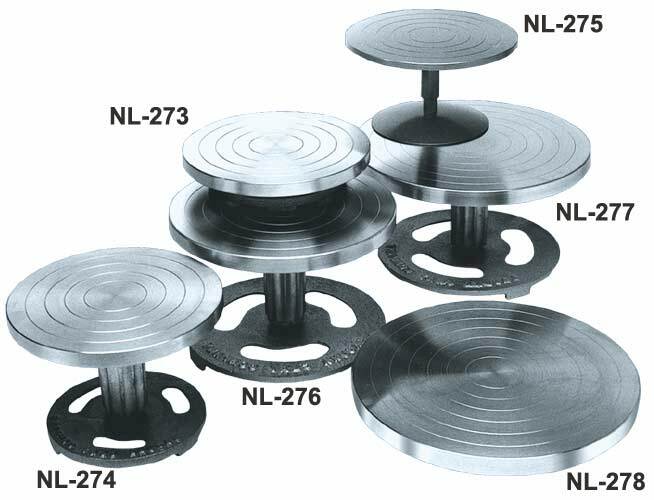 Even the steel plate wheel NL-275 with 5" shank is designed for large hand use.